Editor’s Note: Now that Apple’s third-generation has arrived in stores, that means a lot of earlier models of Apple’s tablet could find themselves looking for work. If you’re upgrading to a new iPad, you don’t necessarily have to sell your old tablet or give it away. This is the first in a series of articles in which we look at ways to give your old iPad a new purpose. In this installment, we focus on the iPad’s potential as a dedicated kitchen companion. The App Store is stuffed with apps for planning out meals, organizing grocery lists, and discovering new recipes. So it’s little wonder that so many home cooks consider the iPad as indispensible a kitchen tool as a good chef’s knife. So why not take the next logical step and turn that aging iPad into a dedicated kitchen tablet? All it takes is a little bit of planning to find the hardware and software to fit your specific culinary needs. 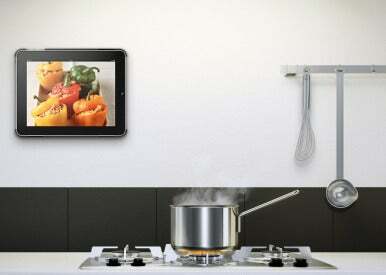 There are plenty of gadgets for cooking with the iPad, from portable stands to wall-mounted systems. If you tend to move around a lot in your kitchen and want the iPad to move with you, Belkin’s $40 Chef Stand and Stylus is a good option to consider. Since the stand comes with a stylus, you won’t need to use any greasy fingers to navigate your kitchen iPad. There’s a drawback to portable stands, though: They tend to keep your iPad in the splash zone, where they’re suscpetible to splatter from whatever you’ve got cooking. You can always waterproof your iPad with other accessories (more on that below). And Belkin’s $50 Kitchen Cabinet Mount is another moveable option that will hang from your cabinets, above the counter mess. If you know exactly where you want your iPad to live in your kitchen, there are screw-in wall or cabinet mounts that will give your iPad a sleek look while you’re mixing ingredients and frying up your latest meal. This is a good option if you want to use your iPad to play music or videos while you’re cooking, or you’re the type of person who doesn’t need to constantly look at a recipe while baking or cooking (like I do). Vogel’s RingO Holder and Wall Mount ($70 for the iPad 2 and $60 for the original iPad) offer a protective backing for your iPad that clips onto a raised, o-shaped wall mount, giving the iPad a cool, floating look. If you don’t have much wall space, permanent cabinet mounts like the $26 Original Kitchen iPad Rack, are a good way to give your iPad a permanent, but safe spot. The great thing about this rack is that while its placement is permanent, the actual iPad tray lifts out of the screwed-in brackets so you can stick it in a drawer when you’re not using it. Like Vogel’s wall mount, The Original Kitchen iPad Rack also gives your iPad a cool floating look because it’s made of clear plastic. And finally, you can mount your iPad onto the refrigerator with one of the many available fridge mounts, such as Belkin’s $40 Fridge Mount or the $50 FridgePad Magnetic Refrigerator Mount. The kitchen can be one of the messiest places in the house, especially while you’re actively chopping and stirring. While many of the iPad mounts and stands can keep your iPad further away from the counter, there’s still a high chance you’ll accidentally splash water or oil or worse onto your shiny tablet. Plus, touching your iPad’s screen with dirty fingers isn’t good for the iPad screen. 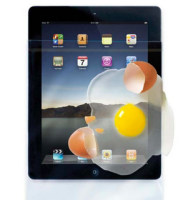 Luckily, there are a few ways to protect your kitchen iPad from liquid terror and grease marks. Protective sleeves like the Chef Sleeve, CleverWraps, and Locksaks fit tightly around your iPad while waterproofing the device. (For $20 you can get a 25 pack of Chef Sleeves, $15 gets you five CleverWraps, and a three pack of Locksaks costs $9.) All of these are fairly thin sleeves, so they don’t obstruct your iPad in most stands and mounts. Looking for a quick and cheap DIY option? Just stick your iPad into an appropriately sized plastic baggie, like Ziploc. Like with any dedicated use of an iPad, it’s best to clear the device of anything that won’t be useful to you in that particular setting. For kitchen use, you might consider clearing out your email settings, games, and non-food related media and apps. You’ll be able to focus on exactly what you need from your iPad while you’re in the kitchen. There are plenty of visually pleasing and interactive cookbook apps, such as Allrecipes, The Photo Cookbook, and Food Network’s In the Kitchen. The original 20 Minute Meals app for the iPhone featuring celebrity chef Jamie Oliver won an Apple Design Award for its meticulous organization two years ago, and the iPad-optimized follow-up—Jamie’s Recipes—is available as a free download. (You buy content packs of recipes through an in-app purchase.) Appetites also has an eye for the visual: The free app features video recipes, so you can see exactly how a dish should be prepared. (Again, you purchase recipe packs from within the app.) Martha Stewart Cookies, recently updated for the new iPad’s Retina display, is a must-have for anyone who enjoys baking. But iCookbook may take the most clever approach for a dedicated kitchen iPad: It features simple voice controls for navigating through recipes, so you don’t have to worry about dirtying up your touchscreen interface when working with raw food. Speak commands like ‘Next’ and ‘Back’ and iCookbook will show you the proper step in a recipe without you having to touch the iPad’s screen. Interactive book publisher Inkling also offers a full-length interactive iPad ebook of The Professional Chef by The Culinary Institute of America, packed with instructional videos, images, and note-sharing capabilities. While the $50 price tag is a lot steeper than cookbook apps, the book’s 36 chapters cover everything from nutrition basics to braising and stewing to charcuterie. 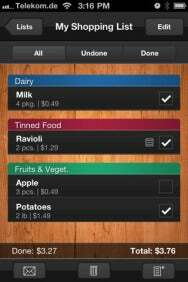 For keeping track of your grocery list, ShopShop - Shopping List and Shopping List are both excellent apps that can sync across all of your iOS devices. (The latter Shopping List, however, is not optimized for the iPad’s screen.) I tend to remember when I need when I’m in the kitchen and realize it’s not there, so entering your grocery list onto your iPad and opening it back up on your iPad while in the store is really useful. Of course, just because you turn your iPad into a dedicated kitchen tablet doesn’t mean you can’t use it elsewhere. Most of the stands and mounts mentioned above make it easy to attach and remove your iPad. But using your old iPad as your go-to tool to access all of your favorite recipes, cooking videos, and more right in the kitchen will certainly give the tablet a new and useful life. This story, "Turn your old iPad into a dedicated kitchen tablet" was originally published by Macworld.